My raw notes on the BLC presentation I just attended remotely. By now, we all know the discussion is not about the tools but underpinned by them. The tools make the classroom setting disruptive. Once a teacher starts using new tools, resistance is not far behind. Darren mentioned boundaries. I cannot recall the exact quote (please correct me if I am wrong), but in my mind I understood boundaries and creative ways of teaching and learning go hand in hand. Until today, I had thought of boundaries as necessary to speak about disruptive technologies or ways of implementing them. Now, boundaries fostering creativity. I need to unlearn and relearn that. You went to a predictable place to learn inside a room, reading books written by experts, which had been carefully selected by authorities (teacher/admin/government) who controlled what, when and how much you learn. This is the old way. The new way is Web 2.0. The problem is the 2.0 concept is dreamlike and fleeting from tools, to web at large, to things the context enables, to ways of using them, to ways very much unlike the best practices of last week, to attitudes, values, people, people who need to connect and make the web a different place. Not just another url the world would not miss tomorrow. People create a presence that being deleted, it would make the world poorer because that unique contribution would be lost. And this reminds me of Carl Sagan regretting the burnt books at Alexandria's library. More than the Web 2.0 metaphor, I like to think we are creating a new Alexandria. No one's the expert. Value is in the collective power of networked minds. Excuse the poor grammar of my previous paragraph, but the new way is not that simple to put in words. My mind was flashing images in a power point. We do not teach things we cannot do ourselves. We do not tell our students this is the road I've travelled, now it is your turn. We invite them to travel with us. We model the walking style. Experienced in creating and sustaining PLE (personal learning environments) for ourselves, we become guides, assistants and facilitators for our students to do the same for themselves. Let's face it, tools need some customisation to work for our purposes. Tools had not been thought for education. I do prefer designing how to include YouTube in my class than play on the safe TeacherTube. Technological possibilities are inspiring, but they need tweaking. This is the point when I feel that sometimes it is about the tools. Above all, we are interpreters. When you study translation, you need to master a process called de-verbalization (my version of desverbalización in Spanish). Simply put, it means grasp the sense before you choose the vehicle word in the target language. That requires reflection. Lots. Then you act and create the old message in new form. Something will necessarily be lost and something gained. Rules of the game, for languages are unique. This interpreting skill is something all of us have the responsibility of acquiring, much more than learning which tool is easier or which features are the new killer apps we need. We need to take the tool out of its original context to imagine meaningful ways to use them in our classroom. This interpreting process lies at the heart of our reflective practice in blogs. This is how new pedagogies are born. More than asking 'how can I use this', ask yourself 'who am I going to use this with' 'to what purpose'? When I cannot answer these questions, I simply do not use new tools. Period. Even if I am fascinated about them. That is why I do not use Twitter with my students although I learn lots from it. There is yet another role, the teacher evangelist (for lack of a better term). These are the teachers who need to share among colleagues. They cannot imagine going back to working alone. The teachers who feel it is their responsibility to persuade decision makers at schools to look at the world and start showing them the value of all our efforts. The need to prepare students for a future that started yesterday. The evangelist role is probably not new. It is always a new challenge. It entails mastering all of the above mentioned roles to go beyond your classroom or school. I feel the edublogosphere is still a small village where we know each other. Will a few teachers with blogs make the change happen? My guess is more teachers with diverse views will have to press publish and make the new Alexandria find its way. Here's one who found her real reasons to write and started last night. Claudia, great stuff. 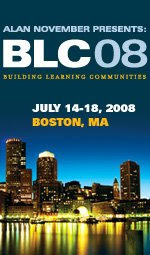 Thanks for sharing your take on this BLC08 preso. I love how you write! These insights are extremely helpful and eyeopening. Perfect timing to summarize for my TESOL presentation at MEXTESOL in a couple more months. Going to make sure that I highlight this blog comment at META also. Thank you for your words. Glad to know you find some resonance here. Please point me to your slides when they are available. Would love to see and learn from what you do with all this. Thanks for this Claudia. I like the way you've synthesized a lot of the ideas from our presentation with your own reflections. Some day you and I have to do this f2f over coffee. Deal. We'll record that conversation from the start. I wouldn't miss any of the ideas springing from our talk.